I won’t start out by arguing whether you should use charts in your knitting. You know if charts sync up with your way of thinking. 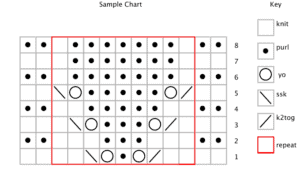 If you want some help with charts – or if you just want a refresher – continue reading. Charts give you a way to visually represent knitting. I say “most” because there are other ways to indicate knitting on a chart. I’m going to show you the way I see most charts presented (and it’s the way I do charts as well). which side you start on. Numbers on the right are for RS rows and numbers on the left are for WS rows. Let’s look at our sample again. We have an 8 row repeat, knit flat. 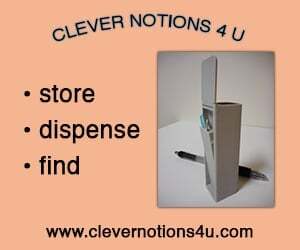 You start reading at the edge where the number is and move in the opposite direction. So, if the number is on the right, read the chart moving to the left (and the opposite). If you’re right-handed this will be the same way you’re knitting. The odd-numbered rows (rows 1, 3, 5, etc.) are RS rows and then even-numbered rows (2, 4, 6, etc.) are the WS rows. In the round or flat? 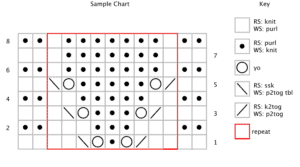 Regardless of the method of knitting, all charts are read from bottom up to the top. If a chart is for something worked flat, you’ll find numbers on both the right and left. Typically you’ll find all the odd numbers on one side and all the even numbers on the other. If a chart is for something worked in the round, every round starts on the right. You’ll find all numbers on that one side. Here’s that same chart, but for in-the-round. Note all the round numbers are on the right, and the key doesn’t have RS and WS stitch descriptions because it’s not necessary. This is somewhat a matter of the chart maker’s preference. 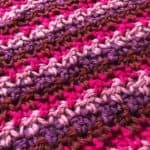 A lot of stitch patterns have what are called “rest rows” where you just work the stitches just like the previous row. So, if the stitch below is a purl as it faces you, you purl it. For YO’s you need to get instructions on how to work them. (or like in our sample chart, we see the WS rows). Sometimes they’re knit and sometimes they’re purled. The pattern should tell you which it is if it doesn’t have WS rows. If the pattern doesn’t have rest rows – meaning that there are things going on (like decreases and increases) then the WS rows must be charted. Every chart should have a key. It might just tell you what the symbol means and it might tell you how to work the symbol. 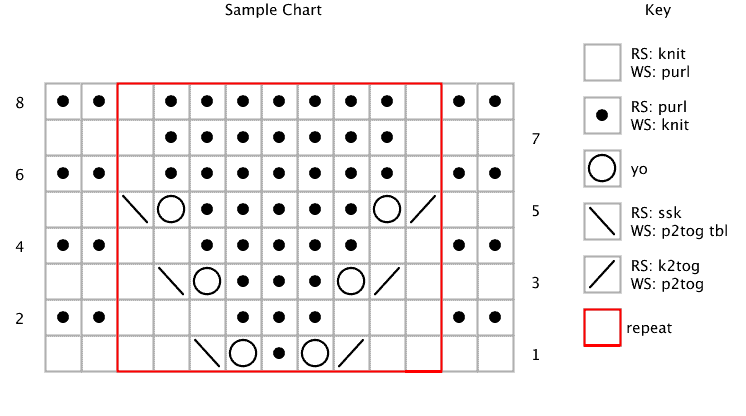 Here’s the key in our sample chart. The chart shows you what you see when looking at the RS. The symbols often look like what you’re doing (purls look like little bumps, YO’s are circles, and the decreases lean in the direction it slants) If your chart is for something in-the-round, you’re set. If it’s for something flat and includes the WS rows, those rows are actually worked in the opposite of what you see on the chart. So, a purl stitch is really worked as a knit, and a k2tog is really a p2tog. The key should tell you how to work the symbol when on both a RS and a WS row (look above at our key). YO is just listed once because the symbol is worked the same way regardless of it being on a RS or WS row. A repeat is often shown as an outline. It may tell you how many times to work it, or you may need to figure that out yourself by counting what’s after the repeat. Here’s our chart again. The repeat is outlined in red. There are 2 sts on either side that are just worked once. In this chart, looking at Row 1, you’d work: K2 (the first 2 sts), *k2, k2tog, yo, p, yo, ssk, k2, rep from *, k2. If you work all the rows of the chart, you often start over again at the bottom. Your pattern should tell you something like “work X reps” or “work until it’s Y inches”. 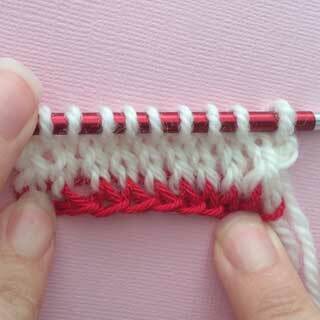 Regular knitting stitches are not square – a knit stitch takes up more space horizontally than vertically. This means the stitch is wider than it is tall. Here’s a good way to remember it. 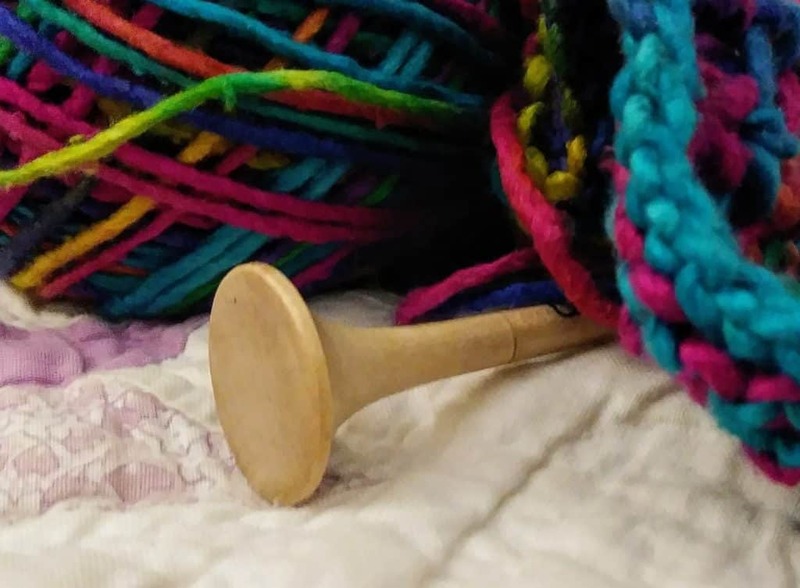 Take a typical gauge – 1824 (that’s 18 sts and 24 rows per 4″). Now if you think about it, it takes 18 sts widthwise to go the same as 24 sts lengthwise. So, the stitch is wider than it is tall. This is exacerbated in garter stitch. 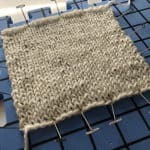 Even though garter stitch that’s worked flat is knit every row, garter stitch is indicated on a chart as a row of knits followed by a row of purls. 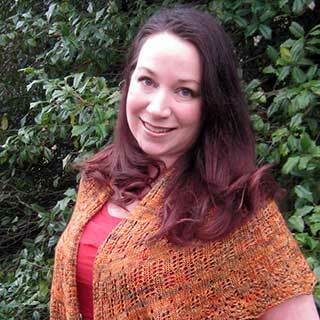 Keep in mind that the chart is showing you what you see – and not necessarily what you knit. The back-side of garter stitch is really just a purl stitch. 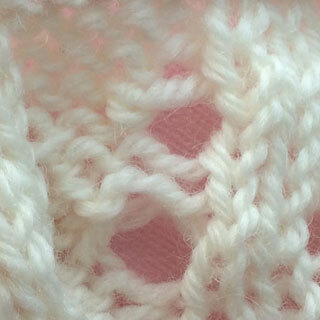 You can see a two-stitch garter stitch edge on either side. 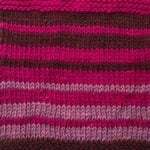 On RS rows, it’s shown as a knit, and on WS rows, it’s shown as a purl. But, when you look at the key, you can see that the symbol for those edges on WS rows are actually knit as well. Let’s look at Row 2. It’s a WS row so it’s read from left to right. Remember to look at the WS definitions of the sts in the key. What did I miss about charts? I re-wrote this article several times just to keep adding to it. I have to admit, given I’ve been using charts for so long, it was hard for me to think of how I felt when first working with a chart. What would you suggest I add? How do you insert a chart into a chart? 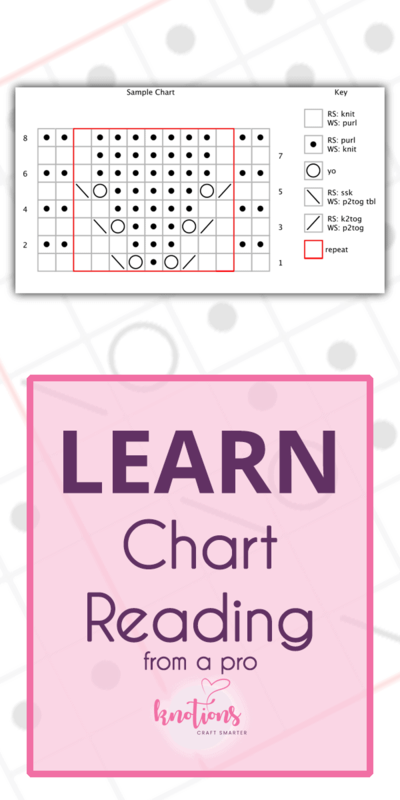 Leaves & Berries Chart says to insert a Leaf Chart into one st…?? which pattern is this? let me know which one and i’ll try to help. I think it would help if you explained, stitch by stitch, the 2nd row of the chart so knitters can actually see the left to right reading and reversal of stitches. That is where people get confused. Good article, thanks. I added the written for Row 2. What do you think? I like it and think it’s a great addition. Thanks again! I love your tutorials! I have always been intimidated by charts but this tutorial helped to take away that fear. 🙂 Also, thank you for the ability to save these tutorials and patterns as PDFs. I love having a copy I can refer to when I can’t be online. I think it would be helpful yo talk about “no stitch” spaces. That is a common question I’ve seen. I know to ignore them and work the next stitch, but I think that is something I’ve learned that wasn’t intuitive at first. Also, you could cover charts that include repeats. Great point about the repeats! That’s one I haven’t covered yet. I do the same thing! It’s SO much easier for me than just executing words. I remember back in the day, using a Debbie Bliss pattern for a cabled cardi that DIDN’T have charts and just how crazy I must have been to do it. The pattern says work only 9 rows . 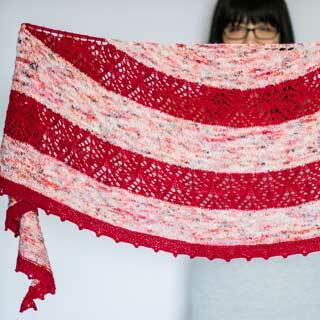 I wonder do I just work the 9 tows over and over till I get to the ankle … do I knit one chart and then knit the 2 row. I’m not familiar with the pattern, but I would think you’d work rows 1-9 repeatedly. I’m confused why you’d think you’d start working on row 2 though and there might be something I’m missing about the pattern.